Talented youngsters from the Paul Davis Fencing Academy showed their class as they dominated the annual Hertfordshire Fencing Junior County Championships at the Herts Sports Village. Team PDFA were on devastating form at the Hertfordshire Fencing Association-organised event, winning 27 medals, with seven of the club’s representatives crowned as county champions. This year saw the largest entry for the competition ever recorded, with 135 fencers entered across all age groups from U10 to U20 level. Team PDFA selected 60 fencers from across their 34 sessions to represent the Academy at the event. For some fencers this was their first outing in a competitive environment outside club sessions, but they showed no nerves as they bagged a hatful of medals. Stand-out performances came from Anna Dunham, winning gold in the O13 sabre by beating last year’s British youth champion; Alex Culkin winning silver in the U12 boys’ foil; Owen Grosvenor taking gold in the U20 boys’ foil; Luke Barbour triumphing in the U16 boys’ foil ; and Gabriella Karouzis winning five golds, including the U12 girls’ sabre. 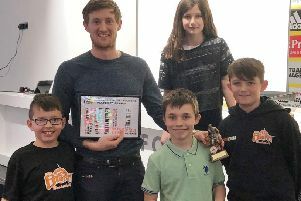 Team PDFA – who now coach 500 children a week in Hertfordshire – have recently started teaching at South Hill Primary School in Hemel Hempstead. The club also supports wheelchair fencer Piers Gilliver, who is ranked number one in the world and is currently taking part in the qualifiers for the Rio Paralympics. Alternatively, visit the PDFA website by clicking here.